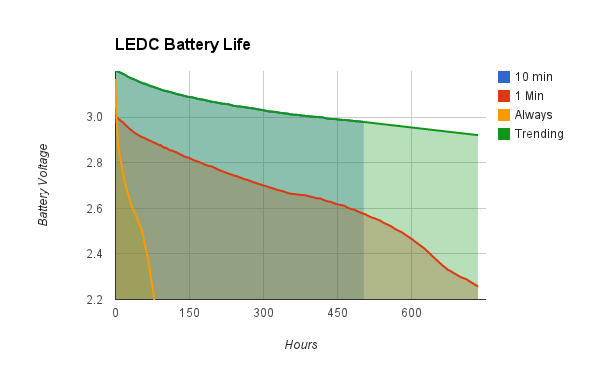 The third LEDC battery life test has reached a new milestone of over 800 hours surpassing the previous two tests and it has a lot more to go. This entry was posted in Electronics and tagged Battery life, battery powered, Binary Clock, Binary coded decimal clock, buzzer, Dice game, digital clock, electronics, Hour Glass count down timer, LED Matrix, Microchip, military time digital clock, PIC, Pomodoro Timer, Scrolling text message mode on May 10, 2014 by cburns. Well Brown Season is over but it’s been replaced by Mud Season. It’s nice to have a nice bright sunny day, but often this time of year these can be hard to come by. Fortunately a grey sky can provide a nice flat light and a bit of rain can add some visual interest. This entry was posted in Photography on May 10, 2014 by cburns. 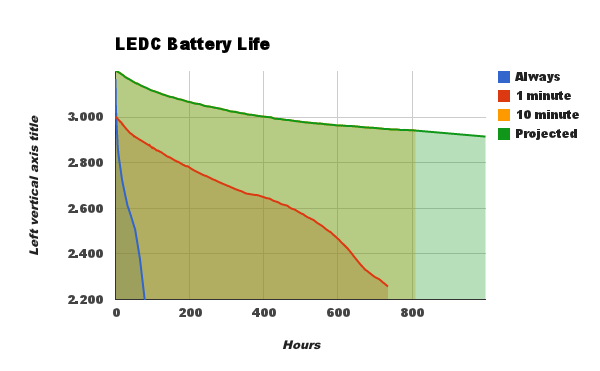 The third LEDC battery life test is well under-way after 500 hours. The LEDC is configured to wake every 10 minutes and chime the hour. With these settings it appears this test is going to take a while. This entry was posted in Electronics and tagged Battery life, battery powered, Binary Clock, Binary coded decimal clock, buzzer, Dice game, digital clock, electronics, Hour Glass count down timer, LED Matrix, Microchip, military time digital clock, PIC, Pomodoro Timer, Scrolling text message mode on April 27, 2014 by cburns.